A student of Jomo Kenyatta High School preparing to seat for the Kenya Certificate of Secondary Education examination which started Monday, has been confirmed dead just two hours to his mathematics paper. 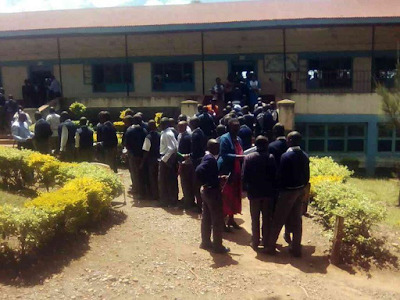 The KCSE candidate identified as Francis Gikonyo had been rushed to the district hospital in Nakuru after he was found critically ill, but on getting to the hospital the unlucky student collapsed and died. ‘It is very unfortunate that we lost a young and brilliant boy who had a bright future, the student had a chat with medics before collapsing and dying, adding he died from hypertension'. Mr. John Mureithi also confirmed that the boy's parents were informed of his death and counselors were invited to break the news to his classmates.